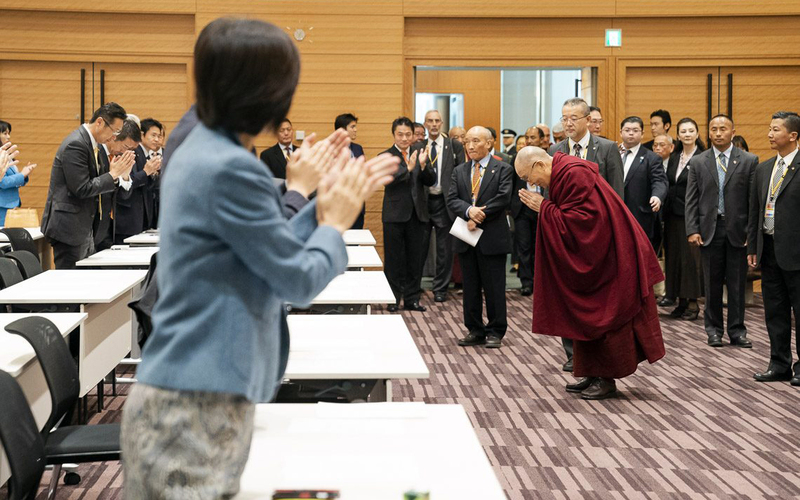 (TibetanReview.net, Nov21, 2018) – China on Nov 20 criticized Japan for allowing the ongoing visit by Tibet’s exiled spiritual leader, the Dalai Lama, saying countries should not facilitate his “separatist activities”, reported the PTI news agency Nov 20. The Dalai Lama is on a 10-day visit to Japan, beginning Nov 12, to mainly give religious teachings and public talks, take part in a conference with scientists, and interact with students in educational institutions. Asked about the Dalai Lama’s reported comments that China and Tibet should co-exist and prosper together, China’s foreign ministry spokesman Geng Shuang has said the Tibet issue was an internal matter of Beijing. “As for the Dalai Lama’s speech, it is not up to me to answer this question. I can tell you that the 14th Dalai Lama is a political exile and he is engaged in separatist activities,” Geng was quoted as saying. “We hope the relevant parties will not provide facilitation for his separatist activities,” he has added. The Tibetan administration in exile in India says Tibet was historically an independent country but that it was willing to settle for autonomy through a negotiated deal which would ensure the survival and sustenance of the cultural identity of an ethnographically defined Tibetan region. China insists, however, that Tibet was part of China since ancient times and there is no Tibet issue remaining to be discussed.